When the Spanish defeated the mighty Aztecs, they didn’t do it alone. They had help. In fact, Hernán Cortés and his handful of Spanish conquistadors allied with thousands of indigenous fighters from various parts of the Aztec Empire and neighboring political entities who were at war with the Aztecs. A great number of the fighters came from Tlaxcala, described in the history books as a republic or kingdom, wholly surrounded by the Aztec Empire and constantly at war with its larger neighbor. The war the Aztecs had with the Tlaxcalans would never end, and according to one Spanish chronicler at the time, Aztec Emperor Montezuma said this when asked why the empire did not just absorb the Tlaxcalan Kingdom: “We could easily do so, but then there would be nowhere for the young men to exercise themselves without going a long way off, and besides we always like to have people to sacrifice to our gods.” All of Mesoamerica feared the armies of the Aztec Empire. The patron god of the Aztecs and the protector of their capital of Tenochtitlán was Huitzilopochtli, the ancient Mexican war deity. The conquering Spanish noted just how much of the Aztecs’ daily life revolved around war and just how much their military might was feared by others. Where did this warlike nature come from and what were some of the justifications the Aztecs used for making war? The Aztec priestly class had an answer for everything, even for the origins of war. According to Aztec beliefs, mankind lived peacefully on earth in a time before history and a time before organized cities and towns. Nature had a delicate balance with the sun ruling over everything. The 400 Cloud Serpents, or in Nahuatl, the Centzon Mimixcoa, were responsible for feeding the sun. These flying serpents would swoop down on a jaguar, for example, and bring it to their sky lord for nourishment. These gigantic flying snakes rarely interacted with humans who lived peacefully on earth. One day, the 400 Cloud Serpents decided to shirk their duties and stopped hunting on earth to bring the sun food. They lapsed into a state of degeneracy, making elaborate feathered costumes for themselves and getting drunk on a drink called tziuactli. In one version of the story, the flying snakes, now elaborately adorned with feathers and jewels, even took human women as their concubines. The sun needed help to restore order in the skies, so he asked the humans on earth for help. The sun chose 4 brothers and their sister, the last humans to be created by the gods, to help fight the flying serpents. In the Codex Chimalpopoca, history records their names: Cuāuhtli-icohuauh “Eagle’s Twin,” Mix-cōātl “Cloud Serpent,” Tlo-tepētl “Hawk Mountain,” Apan-teuctli “River Lord” and their sister, Cuetlach-cihuatl, or “Wolf Woman.” The sun gave the chosen siblings poison darts and shields and because the humans were unfamiliar with war, the sun instructed them how to use their new implements. “My children, pay attention,” the sun said. “You must now destroy the 400 Cloud Serpents who offer me nothing.” So, the 5 siblings hid in different areas waiting for the sky snakes to swoop down on earth. A great battle ensued, the first time people of earth made war, and the 400 Cloud Serpents were defeated. The sun put the serpents in sky for all eternity where they can be seen today as the northern stars. The humans enjoyed making war, and instead of the cloud serpents, from that time forward they would serve the sun and feed him with sacrifices made in war. The secondary reason for many of the Aztecs’ wars was to ensure a steady supply of human sacrifices for their sun god. The Aztecs had many primary causes for engaging militarily with their close neighbors and with the kings of distant lands. Underlying these reasons for war was a sense of a kind of Mexican “Manifest Destiny” that the Aztecs had. The Aztecs saw themselves as the rightful heirs of the cultural and political legacy of the Toltecs before them, and as such they believed that it was their right to conquer all of Mesoamerica because the land was already rightfully theirs. In the backs of their minds the Aztecs felt that any conquest was ultimately justified by destiny itself and their right to rule over everyone in their known world. Any independent kingdom or chiefdom that wanted to stay independent was seen as a rebel. However, they needed excuses to initiate warfare and had some tried and true ones. One o f the biggest causes of war was a foreign attack or harassment of Aztec merchants or long-distance traders called the pochteca. For more information about this class of merchants please see Mexico Unexplained Episode #102. While many non-subjugated peoples enjoyed having the pochteca visit them, bringing them precious trade goods from all corners of the Aztec Empire, many local rulers did not trust them and saw them as spies or an informal scout force to size up the territory for potential invasion. It was a strange balance, though, because even though the locals and the rulers wanted the goods the long-distance traders carried, they knew that if anything happened to the pochteca, the weight of the empire would come down on them, beginning with a war and ending with possible subjugation and absorption into the greater Aztec collective. Even telling the pochteca that they were not welcome without causing physical harm to them might have angered the Aztec emperor enough to invade. In some instances, the war-inducing disagreements over trade were very minor. In an early account, when the empire was in its infancy, a small group of women traveled from the Aztec capital of Tenochtitlán to the small chiefdom of Coyoacán to sell fish, frogs and ducks in their central market. Guards at the market, acting on their own, took away the women’s merchandise. The angry merchants went back to the Aztec capital and complained to the rulers. The king of Coyoacán’s words in an address to his privy council have survived to this day. The ruler said, “Brothers, you see that the Aztec women do not come to the market anymore. This is no doubt because of the insults that we have offered them. Let us then get out weapons ready, our shields and our swords… for soon we shall see the Aztecs coming, led by the banner of the eagle and the tiger.” Other causes of war were sometimes based on simple mistrust. Rumors of secret alliances between various cities and tribal groups kept the Aztec military machine on high alert at all times. Aztec power was forever challenged and with the growth of the empire came more military engagements, sometimes in very distant lands. In the example previously cited, after the second 20-day period, with another envoy to confirm that nothing had changed, the Aztecs invaded and conquered Atzcapotzalco in a matter of less than a week. These elaborate rules of war were always strictly adhered to. While the Aztecs seemed determined to expand their empire through conquest, they had a high degree of chivalry and decorum regarding war which was unparalleled in the rest of the world. Underlying the idea of making war was the idea that it had its roots in divine judgment. The gods ultimately decided the final outcome. With their gods watching, the Aztecs felt the need to adhere to strict rules of fairness and openness in the negotiating process leading up to physical conflict. Their chivalry was part of their almost scientific approach to war. 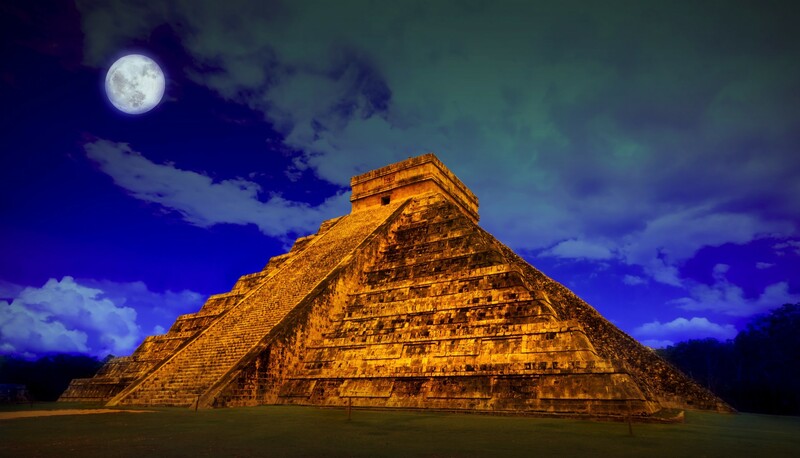 The Spanish arrived to the central Mexico plateau when the Aztec Empire was still on the rise, expanding and conquering its neighbors, using its proven method of warfare to stretch itself from north-central Mexico to the Pacific coast of modern-day Guatemala. Given this ever-growing war machine and the impetus behind it one only wonders how large the empire would have grown had the Spanish not arrived. McHenry, J. Patrick. A Short History of Mexico. New York: Dolphin Books, 1962. Soustelle, Jacques. Daily Life of the Aztecs. Standford, California: Stanford University Press, 1961.